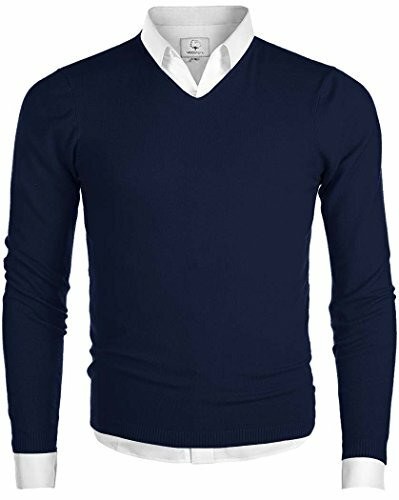 Style: Long Sleeve, Knitwear, V Neck, Solid Color, Regular Fit / Slim Fit. Buyers are welcome to leave honest and unbiased review to real MiCotton products. It Is All About Life Style, A Perfect Gift For Friends, Husband, Father, Dad, Uncle, Grandfather, Boyfriend Or Families. 1. Will the cloth shrink after wash? The possibility of shrinking is small as each one has been tested and processed before selling. Except the color of the string may be different, others are the same with the picture. Due to monitor's brightness/contrast settings etc, the color tone of the website's photo and the actual item could be slightly different. Customers can contact us with picture as proof if they believe they received wrong item, we will support accordingly. Hand wash or machine wash, dryer or ironing is not recommended. Any Other Question, Please Feel Free to Contact us, our Customer Service Team will be Happy to serve you. Size: The Pullover is Regular Fit, Standard US sizes. Not too loose, not too tight / It fits perfectly for Normal Body shape. If you are Big or Muscular, Please Choose one size up.